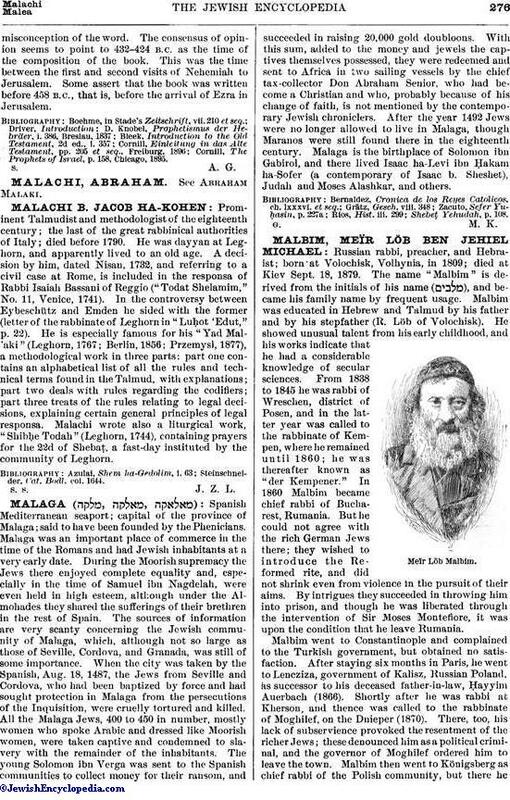 The Book of Malachi is the last in the canon of the Old Testament Prophets. It has three chapters in the Masoretic text, while in the Septuagint, the Vulgate, and the Peshiṭta it has four. The King James Version also, following the latter versions, has four chapters. As in the books of Isaiah, Lamentations, and Ecclesiastes, the last verse in the Masoretic text is a repetition of the last verse but one. The style of the book is more prosaic than that of any of the other prophetical books; the parallelism met with in the others is here less pronounced, and the imagery often lacks force and beauty. The method of treatment is rather novel; it approaches the teaching method of the schools; Cornill speaks of it as "casuistic-dialectic." Thus the prophet first states his proposition; then he follows with remonstrances that might be raised by those he addresses; finally he reasserts his original thesis (comp. i. 2 et seq., 6 et seq. ; ii. 13 et seq., 17; iii. 8, 13 et seq.). This form adds vividness to the argument. The book may be divided into three sections—(1) i. 1-ii. 9; (2) ii. 10-17; (3) iii. (A. V. iii. and iv. ), the divisions given being those of the Masoretic text. Ch. i. 2-ii. 9 represent Yhwh as Ruler and loving Father. It opens with a tender allusion to the love shown by Yhwh to Judah in the past; yet Judah acted faithlessly, deserting its benefactor. Malachi then addresses himself to the priests, those who are to lead the people in the way of Yhwh. He castigates them for being derelict in their duty by offering on Yhwh's altars polluted bread and animals that have blemishes. By doing so they show that they despise Yhwh (i. 6-10). But Yhwh can do without their worship, for the time will come when the whole heathen world will worship Him (i. 11-14). If the priests will not heed the admonition, dire punishment will be visited upon them (ii. 1-8). Ch. ii. 10-17 speaks of Yhwh as the supreme God and Father of all, and inveighs against those who had left their Jewish wives and married heathen women. Ch. iii. (A. V. iii. and iv.) speaks of Yhwh as the righteous and final Judge. It begins with the announcement that the messenger of Yhwh will come to prepare the way for Him by purifying the social and religious life (1-4). Yhwh will call to judgment all those who have transgressed the moral law and have been lax in the observance of the ritual; He invites all who have gone astray to return to Him and receive His blessings (5-15). The faithful will be blessed, while those who persist in disobeying the law of God will be punished (16-21). The book closes with a final exhortation to the godly. Malachi, as opposed to the other prophetical books, lays much stress upon ceremonial observance (i. 6 et seq., 13 et seq. ; iii. 7 et seq., 22): the priest is Yhwh's messenger (ii. 7, iii. 3 et seq. ), and the law of Moses, with its statutes and observances, must be strictly observed (iii. 22). Yet he is not a formalist; the book breathes the genuine prophetic spirit. Thus, from the idea of the brotherhood of all Israelites he deduces the social duties which they owe to one another (ii. 10). Ceremonial observance is of value in his eyes only so long as it leads to spiritual service. In scathing language he lays bare the moral degeneracy of his time, a time given over to adultery, false swearing, oppression of the hireling and the widow and the fatherless (iii. 5 et seq.). Especially severe is he toward those who had entered into wedlock with heathen women (ii. 11-16). The conditions that existed under his predecessors Haggai and Zechariah seem to have existed at the time of Malachi. The Exile is a matter of the past; the Temple is built, and sacrifices are being offered (i. 10, iii. 1-10). Malachi describes most faithfully the temper of his generation. The people had strayed away from Yhwh, and sought, by an assumption of indifference and by mockery, to hide their restlessness. The exiles had been disillusioned when they found the land of their fathers a wilderness. Drought, locusts, failure of harvests (iii. 10 et seq.) had deepened their discontent. Yhwh's sanctuary had been rebuilt, but still their condition did not improve; they were growing impatient and were asking for proofs of Yhwh's love (iii. 13 et seq.). Under the pressure of these unfavorable circumstances, priests and people neglected to show Yhwh the honor due to Him (i. 2 et seq.). Malachi lays stress upon the inevitableness of the Day of Judgment, the coming of which would prove to the skeptical that devotion and fear of God are not in vain, but will be rewarded. The messenger of Yhwh and the Last Judgment form the closing theme of Malachi's prophecy. The messenger will come in the person of Elijah, who will regenerate the people and restore them to union with Yhwh. Malachi is identified with Mordecai by R. Naḥman and with Ezra by Joshua b. Ḳarḥa (Meg. 15a). Jerome, in his preface to the commentary on Malachi, mentions that in his day the belief was current that Malachi was identical with Ezra ("Malachi Hebræi Esdram Existimant"). The Targum of Jonathan ben Uzziel to the words "By the hand of Malachi" (i. 1) gives the gloss "Whose name is called Ezra the scribe." According to Soṭah 48b, when Malachi died the Holy Spirit departed from Israel. According to R. H. 19b, he was one of the three prophets concerning whom there are certain traditions with regard to the fixing of the Jewish almanac. A tradition preserved in pseudo-Epiphanius ("De Vitis Proph.") relates that Malachi was of the tribe of Zebulun, and was born after the Captivity. According to the same apocryphal story he died young, and was buried in his own country with his fathers. The name is not a "nomen proprium"; it is generally assumed to be an abbreviation of (="messenger of Yhwh"), which conforms to the Μαλαχίας of the Septuagint and the "Malachias" of the Vulgate. The Septuagint superscription is ὲν χειρὶ ἀγγήλου αὐτοῦ, for . Wellhausen, Kuenen, and Nowack consider ch. i. 1 a late addition, pointing to Zech. ix. 1, xii. 1. Cornill states that Zech. ix.-xiv. and Malachi are anonymous, and were, therefore, placed at the end of the prophetical books. Mal. iii. 1 shows almost conclusively that the term was misunderstood, and that the proper name originated in amisconception of the word. The consensus of opinion seems to point to 432-424 B.C. as the time of the composition of the book. This was the time between the first and second visits of Nehemiah to Jerusalem. Some assert that the book was written before 458 B.C., that is, before the arrival of Ezra in Jerusalem. 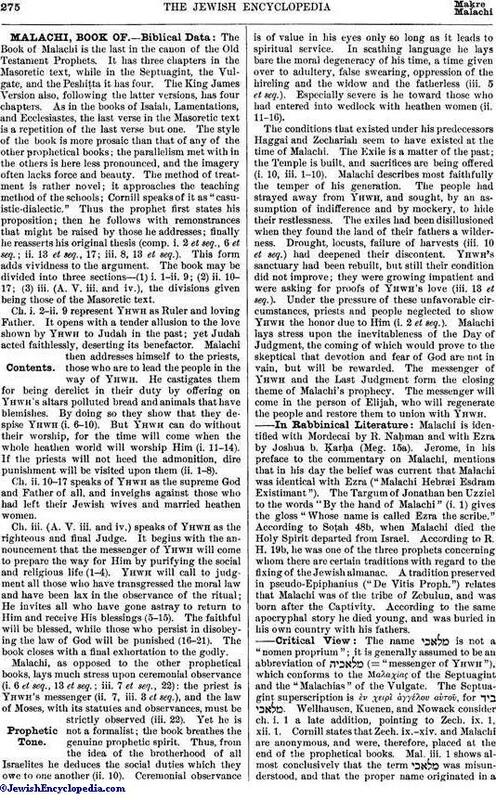 Cornill, The Prophets of Israel, p. 158, Chicago, 1895.